Who killed the concept album? Perhaps the iPod, where suddenly thousands of songs could be ripped from their contexts and shuffled with ease. Perhaps the iPhone brought more damage, with smaller storage space leaving room only for one’s favourite tracks. Whatever the case, the unique experience of sitting down to hear an entire carefully crafted album has become an all but forgotten pastime. Some stubborn musicians today still tailor the “concept album experience” for equally stubborn fans; but for the most part, shuffling is the new norm. “So what?”, a bratty youth will declare. What’s lost is following the ebb and flow of a musical journey. What’s lost is hearing a song as greater than the sum of its parts. Concept albums tell a story and take you somewhere; an experience lost with shuffle listening. Ironically, long before the iPod came onto the scene, God’s children have been reading the Psalms on shuffle. But what if this “shuffle reading”, however edifying, is reading the Psalms with blinders? What if the Psalter is not Israel’s Greatest Hits, but rather Israel’s Sgt Pepper’s Lonely Hearts Club Band or The Wall? Recent Psalms scholarship is beginning to argue along these lines, but their work is still in the pioneering stage and relatively inaccessible to most Christians. O. Palmer Robertson’s The Flow of the Psalms is timely for making such insights accessible and attainable for any interested reader and providing valuable insights in reading the Psalter as a book. After a short introduction explaining some of the benefits to this way of reading, Robertson identifies twelve basic structural elements that reveal an intentional Psalter arrangement. Next, he places the Psalter within its redemptive-historical context, arguing that they flow primarily from the Davidic covenant; the climax of the OT. From here, each Book of Psalms (I-V) is considered in turn, considering virtually every Psalm and its role. Robertson contends that a storyline progresses throughout the Psalter and each Book moves it forward. Beyond the abundant insights gleaned from recognizing design and purpose in the Psalter’s arrangement, The Flow of the Psalms exhibits other particular strengths; perhaps greatest, its accessibility. Robertson’s writing is clear and concise, mostly avoiding scholarly jargon (though numerous footnotes are thankfully present). What I consider the most unique and useful contribution in The Flow of the Psalms is a focus on how the Psalter’s structure aids memorisation through elements such as Hallelujah collections and Acrostics appearing in key places. Robertson assists this by identifying each Book with a summarising heading (e.g. Book 3, “Devastation”) that aptly aids in grasping the flow of the Psalter, but also in memorisation. What’s more, at the end of the book are several colour pages visualizing Robertson’s outline of the Psalter. Naturally, being a book on 150 Psalms, one will not be convinced by everything Robertson advocates. One dominant structural element for Robertson (and others) is coupling of Messiah-Torah Psalms that reflect Ps 1-2 (Ps 18-19; 118-119) and halve book I and V. Though compelling, I think these couplings are unconvincing. As to Ps 118-119: Is Psalm 118 plainly messianic? Psalms scholars are divided. The Ps 118-119 structural pairing also results in a downplaying of Ps 110, the most quoted OT passage in the NT. Moreover, Michael Snearly argues convincingly in The Return of the King (my review) that Ps 118 belongs with Ps 107-117, not with 119. As to Ps 18-19: By giving Ps 18-19 a controlling significance, the compelling chiastic unit of Ps 15-24 is dismissed. But since Ps 18 and 20-21 are similar, perhaps it’s better Ps 19 as sandwiched between Messiah Psalms? What’s more, some of Robertson’s labels are vague. Labelling Psalms 20-24, 45-48, and 75-76 as “Kingship Psalms” is a good example. This label blurs the main point of some of these Psalms by categorizing them as about kingship. Is the famous picture of suffering in Psalm 22 primarily about “[bringing] together Messiah’s kingship and Yahweh’s kingship” (p71)? And while shepherd does have oft-forgotten kingly overtones, is Psalm 23 primarily concerned with Yahweh’s kingship? It also implies that Psalms in other groupings are somehow less – or not at all – about kingship. But in light of the abundant insights throughout the book, these points are relatively minor and subjective. Gold should not be thrown away due to some dross. Like any book with fresh ideas, The Flow of the Psalms provokes original thought and invites engagement. 2015 was an excellent year of reading, and The Flow of the Psalms certainly is among the year’s best. In preparation for teaching the Psalms at CCBCY, this has not only helped me grasp the big picture of the Psalms, but also provided a teaching plan that surveys the flow of the Psalter. I tweaked this big-picture outline during the semester, as my own thoughts began to crystallise, but The Flow of the Psalms was invaluable for giving me the foundation. I expect The Flow of the Psalms will do the same for countless other pastors and teachers. However, rich with insights, any Christian interested in giving up the Psalms on shuffle should pick this up and recover the Psalms’ epic concept album. The concept album is not dead; long live the Psalter. Many thanks to IVP UK for providing a copy of The Flow of the Psalms in exchange for review. 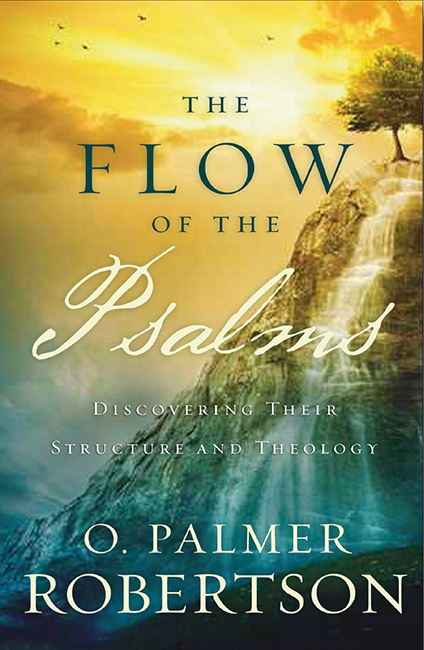 Giveaway: The Flow of the Psalms by O. Palmer Robertson!